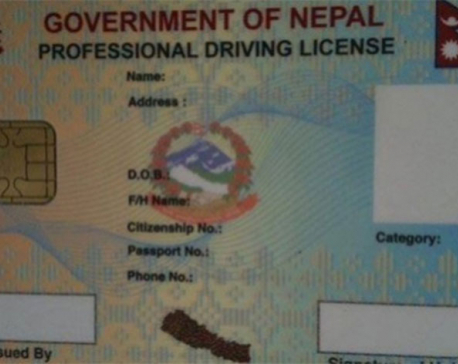 KATHMANDU, Nov 16: The Department of Transport Management (DoTM) is all set to reopen the applications for driving licenses from November 25. The online applications for driving license will start from November 25 at 10 am. DoTM officials said there are four designated offices in the Kathmandu Valley for online application. They include Transport Management offices in Sukedhara, Ekantakuna, Jagati of Bhaktapur and Thulo Bharyang of Swyambhu. DoTM has made online application mandatory all over the country. The applications forms are available on the website of DoTM. The number of service seekers has increased significantly at the DoTM, compared to the past. Officials said they receive around 5,000 applications a day these days, up from 1,200 on an average until some time ago. When Malika Incorporate started printing smart licenses nearly a month ago, it was estimated that the backlog of around 600,000 licenses would be printed within 45 days. However, the company has been able to print only about 60,000 smart licenses till Thursday. Although the slow pace of work indicates that it could take several months to complete the printing work, Managing Director of Malika Incorporate Surendra Khanal claimed that it won’t take more than 30 days from now. “We were slow because we didn’t get the required data for printing from DoTM. But since the problem has been solved now, our work is going on smoothly,” he said.